Today on CNN’s State of the Union with Candy Crowley, Senators Jack Reed (D-RI) and Lindsey Graham (R-SC) discussed the threat that ISIS poses to the homeland. Both members of the Senate Armed Services Committee agreed that the United States has grave incentives to eliminate ISIS. A full transcript of the interview is available after the jump. CROWLEY: With me now, two members of the Senate Armed Services Committee, Senator Jack Reed is a Democrat from Rhode Island, and Senator Lindsey Graham, Republican from South Carolina. Welcome, both. Senator Graham, let me begin with you. If the president should decide that something is needed, a drone, armed drones or U.S. airstrikes, in Syria, wouldn’t that necessarily require some kind of communication with a man that he would like to see not in office, President Assad? 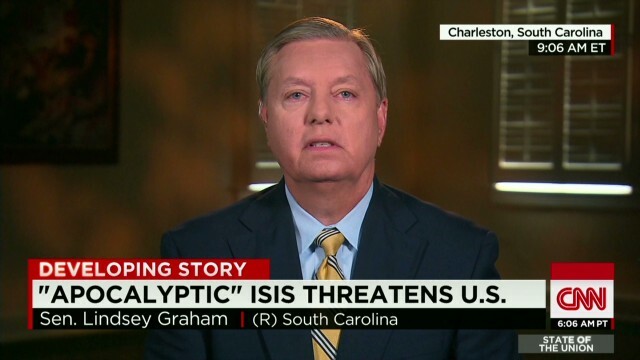 SEN. LINDSEY GRAHAM (R), SOUTH CAROLINA: No, I don’t think so. I think the purpose of going in to Syria is to deal with the threat to the homeland. I don’t think we need to coordinate with Assad at all. The goal is to hit ISIL in Syria, their command-and- control and logistic centers. And, as Senator Dempsey — excuse me — as Chairman Dempsey said, you cannot deal with the ISIL threat in Iraq without hitting them in Syria. But here’s my question. What is the purpose of airpower now? Has the mission changed from humanitarian relief, protecting U.S. personnel in Iraq? They have characterized this as a terrorist attack, so I hope the new mission is to defeat and destroy ISIL as a threat to our homeland. CROWLEY: Senator Reed, we have heard some amazing rhetoric out of Washington, out of Britain, out of a number of places, calling this an apocalyptic group, the worst threat, you know, that the secretary of defense, the Pentagon chief, has ever seen, Chuck Hagel. You know, we have heard this kind of rhetoric before, frankly, in 2002, when we were told that the direct threat to the United States was Saddam Hussein. Tell me why ISIS is a direct threat to the homeland, to U.S. territory here in the United States. SEN. JACK REED (D), RHODE ISLAND: Well, we have to begin with the presumption that they could be such a threat. And then we have to carefully evaluate what their capabilities are, what their intentions are. I don’t think we can simply dismiss them. But to jump from what they have done, which is horrific, particularly the murder of Mr. Foley, to the assumption that they’re going to be an immediate and within days a threat to us here in our homeland, I think you don’t jump to that assumption, but you don’t dismiss it. You carefully look at what they’re doing, what they want to do. And, frankly, it’s in our interests with our regional partners to disrupt and ultimately destroy ISIS because of the threat it poses to interests in the region, as well as in the United States. CROWLEY: In the Middle East. And, Senator Graham, I am trying to kind of — kind of home in on, what is the immediate threat to the homeland? Because there are a number of people saying, it’s not — really not an immediate threat, has to be dealt with. It’s a threat to the region, but it’s not an immediate threat to the U.S.
GRAHAM: Well, I would argue that the intel that we have been provided in Congress is that there are hundreds of American citizens holding U.S. passports. There are European citizens going to the fight that can penetrate America by having European-U.S. passports. A lot of jihadists have flocked to area. They have expressed the will to hit the homeland. That’s part of their agenda is to drive us out of the Mideast. Do they have the capability to hit the homeland — homeland? I would say yes. It’s about time now to assume the worst about these guys, rather than to underestimating them. They’re not the J.V. team anymore. They’re the most prominent terrorist organization in the world, but they’re not the only one. They’re in competition with the other jihadist groups. And the gold medal will be awarded to the group that can hit America. They’re fighting for status with al Qaeda, al Qaeda in the Arabian Peninsula, al-Nusra. All of these guys are bidding for future recruits and status, and the gold medal goes to the one that can hit us here at home. To those who underestimate this threat, you do so at America’s peril. CROWLEY: I want to read you both something that the FBI put out. And, again, it was a pretty scary rhetorical week from leaders from a lot of different countries. It just seems to me, Senator Reed, that we’re hearing different messages here. REED: Well, I — we have to be concerned about this group. REED: Well, we have to do something. And it is to start looking very carefully at all of our intelligence to see if there are intelligence gaps. And, as Senator Graham indicated, one of the issues is hundreds of individuals with European or American passports. So, this is a law enforcement, intelligence operation initially. And we have to be very serious about this, but, again, I think what we have to do is in a way that we don’t dismiss the worst possibility, but don’t assume it’s going to happen automatically. We have to be careful in our analysis. And that’s something that that message from the FBI and Homeland Security is saying. CROWLEY: Senator Graham, the president came out and spoke after it became news about the grisly beheading of journalist James Foley. What’s the consequence of killing an American civilian by beheading them as part of a jihad? GRAHAM: Well, Mr. Rhodes, the — one of the deputy national security advisers, characterized this as a terrorist attack against America. The president has said there would be consequences. Here is the question. Can America be safe if ISIL is not defeated? I don’t think we can. Can the region be safe if ISIL is not defeated? And to be defeated, they have to be hit in Syria, and you have to rally the Kurds, arm the Kurds to attack ISIL in the north, political reconciliation in Baghdad, rally what’s left of the Iraqi army, pull the Sunni tribes away from ISIL inside of Iraq, arm what’s left of the Free Syrian Army. We should, in my view, look at ISIL as a direct threat to the United States, a threat to the region that cannot be accommodated. The strategy has to meet the threat. It is no longer a humanitarian endeavor we’re dealing with, protect the Yazidis or the Christians. It’s no longer U.S. personnel in Iraq. We’re now directly threatened by ISIL. And the strategy and response should meet that threat. What is the purpose of airpower? I want the president to explain to us what we will be doing in Syria if we go there and why. CROWLEY: What do you want the president to do? It’s clear Senator Graham wants him to do more, to use airpower to begin to defeat ISIL. Is that the proper strategy, as far as you’re concerned? Is it something Congress would go along with? REED: Well, the proper strategy is a comprehensive strategy, and its foundation is political, not just military. REED: No, no, no, I’m talking about reconciliation… CROWLEY: Between the Sunnis and the Shias. REED: … the Kurds and other Iraqi citizens. But ISIL is taking advantage of the alienation of the Sunni community in Iraq to move through them to get support, to get assistance. We have to separate that. And that can only be done through the leadership in Baghdad, through the Iraqis themselves. Once we start separating these jihadist extremist terrorists from their support from the Sunni community, then I think we have much more traction against them. On the ground, it’s going to have to be Iraqi forces and Kurdish forces, supplemented very carefully by American air support. The other issue, too, is developing the intelligence and the targeting, so that, if we’re going to take a line of communication out or we’re going to take out an individual, it’s very carefully established, the intelligence, so we’re not just, you know, dropping bombs blindly. In fact, had we gone in initially, as some had suggested, and just started dropping bombs when Maliki was there, we would have ended up as his air force, and he still might be there. CROWLEY: Senator Graham, I want to turn you to one last thing that came up this week, and that was the White House putting out the story of the failed attempt to rescue James Foley and other Americans thought to be in the hands of Islamic terrorists. It happened more than a month ago. There was some question as to whether, A, it was wise to put it out, and, B, why it was put out, with critics saying this looked like the president wanted to say, I did try to help James Foley. Do you think anything was harmed by the White House saying, here’s what happened? GRAHAM: I don’t really know. And my beef is not with the president being on vacation with his family. My beef is not with the disclosing of the operation to try to save these folks. My concern is that the president’s strategy of leading from behind and light footprint has failed. He has to realize, as President Bush did, that his strategy is not working. President Bush adjusted his strategy when it was failing, and he brought about a surge that worked. President Obama has to admit to himself, if no one else, that what he’s doing is not working. We have talked about Iraq, but there’s no way you can solve the problem in Iraq without hitting them in Syria. Would the Iraqis accept a follow-on force if we can put the country back together, something we didn’t do in the beginning? I think it would be a huge mistake to leave Iraq if it comes back together without a follow-on force as an insurance policy to protect us. We need to take everything, put everything on the table. We need to hit them in Syria. We need to help the Free Syrian Army mobilize so they can fight them on the ground. When it comes to ground troops, if our military commanders tell us that we need ground forces to defeat ISIL, which is a threat to the United States, so be it. We have got to win and stop these guys. CROWLEY: Senator Reed, last word here. Obviously, Senator Graham wants a much more muscular approach by President Obama. If President Obama said to you, we have got to go in and take care of ISIL, we have to use our airpower in conjunction with the Iraqi forces on the ground or the Kurdish forces, we have to go into Syria, OK by you? REED: If it is directly related to a threat to the United States or our interests there. REED: Specific threat to the United States. CROWLEY: … or just general threat we’re talking about now? REED: Specific threat to the United States in the region or worldwide even, then I think we have the obligation to go in and take out that threat. And he’s already shown that the most effective use of our force is not putting troops on the ground, but using capable troops like the Kurds with airstrikes. That has rolled them back a bit. What we have to do is begin to sort of have the Iraqis reorganize their military, so it’s no longer politicized, it’s an effective military force. Then, with that kind of leadership, and also, we hope, with some type of engagement with all the sectarian groups, we can use Iraqi security forces and, very rarely, but, at times, American airpower to make the difference. CROWLEY: Senator Jack Reed, Democrat from Rhode Island, Senator Lindsey Graham from South Carolina, Republican, thank you both.